Just excited that our little “first look” video of the standard edition hit 5000 views in less than 2 months on You Tube. Still looking for a diecast vendor to make a deal to send us an Elite as soon as they come in so we can get the next video ready. 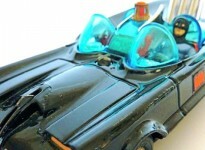 In other video news – we are also gearing up our set of instructional videos on making modifications to the batmobile. Hopefully the first one will be up next week. If anyone else wants to contribute a video – let us know. Also – give us some comments about what specific upgrades you want to see on video. Remember – you can all comment simply by clicking on the “leave a comment” button below the posts.